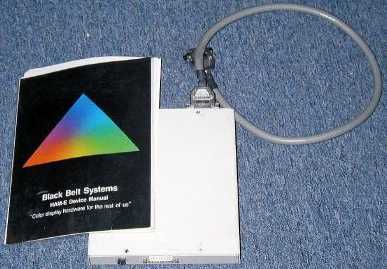 The HAM-E was an external framebuffer unit connected to the normal RGB video output. It was fed a specially coded Hi-Res picture from which it generated a low-res output with HAM8 Colour depth by combining the info from two of the hi-res pixels into one new low-res pixel. The unit offered various modes with a max resolution of about 352x560. Mode information was transmitted through a few pixels in the uppermost video line. The normal Amiga video modes were simply fed through to the output. The HAM-E Plus had additional hard3ware built-in to generate a "fake" high-res output by generating additional pixels between the original pixels using some sort of anti-aliasing. Rumours have it that the HAM-E was killed off at the behest of C= prior to releasing the AGA machines. Page contributors: Gavin Fance, Ralf R Radermacher.